Peter von Tiesenhausen is a Canadian artist and maker of sculptures, installations, and drawings. He lives on a farm inherited from his parents in Demmitt, Alberta, and he works with limited materials, often realizing his sculptures in nature. There are rich deposits of shale gas in the Alberta area, and the relations between the local community and the companies that extract gas through hydraulic fracking are tense. There have been several pipeline explosions and gas escapes, which company owners have interpreted as terrorist attacks. 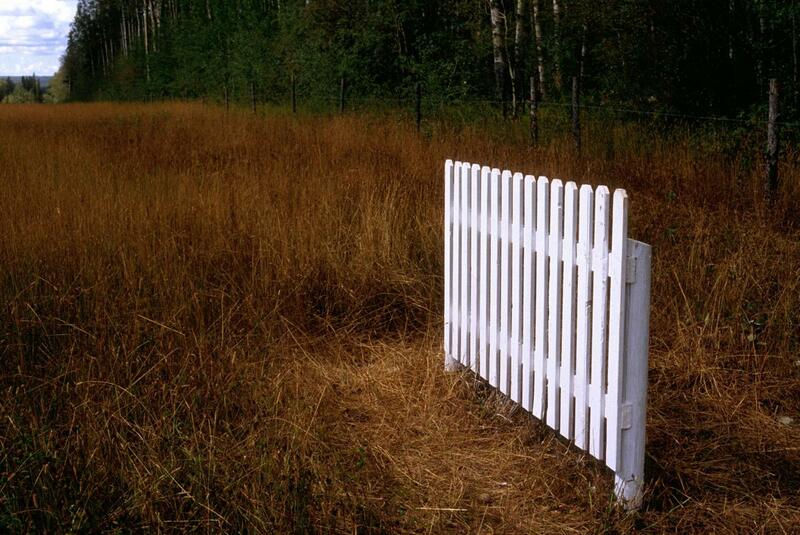 In 1996, von Tiesenhausen defended his property against the proposed construction of a pipeline by building a white fence around the land and declaring that it has the status of a legally protected work of art (see: conceptual edifices). The artist’s action sparked visits by negotiators from ConocoPhillips Canada, including its CEO, who attempted to buy the land. These attempts dropped off after Tiesenhausen began charging five hundred dollars per hour for meeting on his property – activity he considered to be a form of artistic performance (see: 1:1 scale). Finally, the company decided to expand the pipeline by working around the artist’s property, avoiding costly and uncertain litigation. Tiesenhausen is currently involved in the construction of a nearby estate of houses built using straw bale technology. The report presented in exhibition consists of documentation licensed by the Museum of Modern Art in Warsaw for the duration of the exhibition. Courtesy Peter von Tiesenhausen.